5% Earn 5% cash back on your first $3,000 in gas and military purchases annually on these categories combined. 2% Earn 2% cash back on your first $3,000 on supermarket purchases per year. 1% Unlimited 1% cash back on all other purchases. 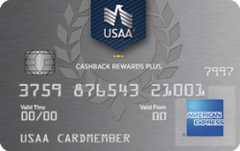 Our take: This no-fee card offers excellent value to USAA members, with 5 percent cash back on gas and military-base purchases, and 2 percent cash back at supermarkets.